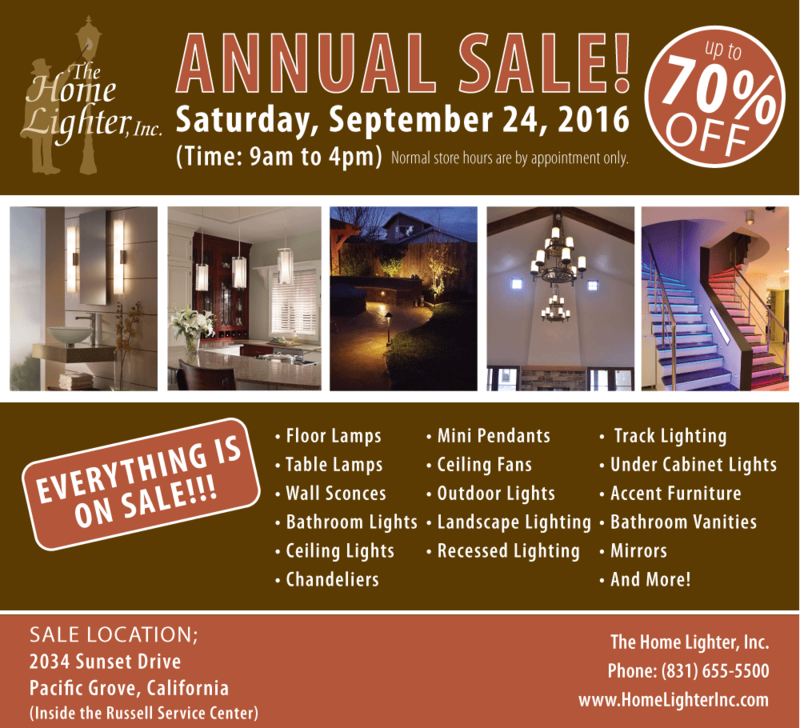 salinas lighting | The Home Lighter, Inc.
We must make room for our new Fall Product. What’s for Sale…? Many one of a kind items, floor samples, open box, returned items, discontinued, slightly damaged, and back-up inventory. If you are building, remodeling, or just need updating YOU DON’T WANT TO MISS THIS ONCE A YEAR SALE! Discounts up to 70%!!!! Many items will be sold BELOW OUR COST. Please note, we will be closed on Thursday the 22nd, and Friday the 23rd in preparation for the sale, and will also be closed on Monday the 26th following the sale. There will be no previews prior to the sale. Due to the nature of the sale Layout, our Design Services will not be available. Normal hours for the showroom are Monday thru Friday by appointment only. To schedule an appointment, please call (831) 655-5500.